I planned to drop off my trash this morning, so I put the bag in the back of the truck last night. I just went outside to make a trash run and pick up one bag of corn for the livestock. The back of my truck was FULL of buzzards. They’d torn open the trash can and scattered chicken bones all over the back of the truck. My truck and the concrete were covered with buzzard poop. I just washed the truck a couple days ago, taking advantage of the warm snap. DAMN. Back into the house for a new trash bag, rubber gloves, and soap, for the truck will need to be washed before I go anywhere. If I go into town, and somebody says “What in the world are those huge splotches all over your truck?” would they even believe me if I said “buzzard poop”? Would somebody just run over a deer or kill a relative and leave the body out in the field so these birds will have someplace else to eat? That picture does not do justice to how many were here. 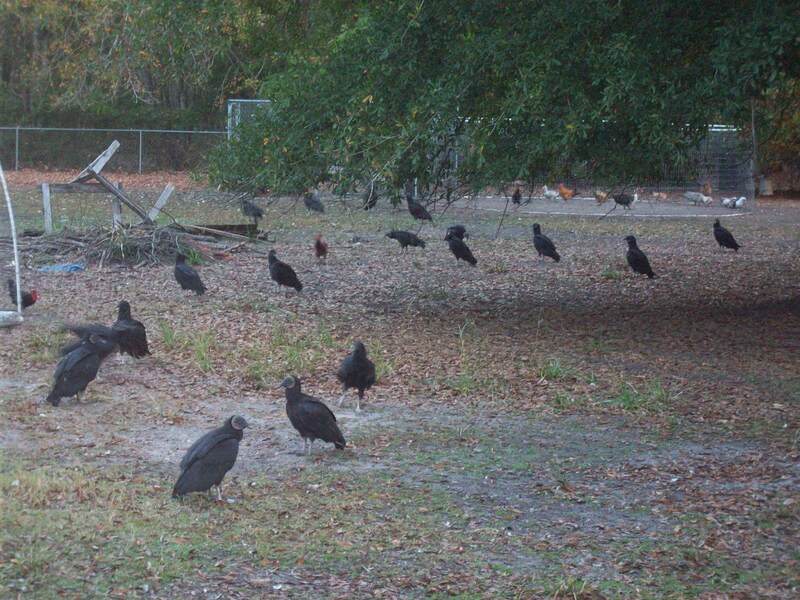 They were lined up wing to wing on the roof of the house, on the outbuildings, and in the trees. They were perched all over my truck, and stalking around on the ground amongst the chickens. And buzzard poop…well, I’m going to be busy hosing things off for about an hour. Well. Perhaps I should look on the bright side. They’d make real short work of any dang zombies that might be lurking. Alfred Hitchcock may be dead, but this is still creepy.